Keep your eyes on the road and your hands on the wheel. How much of the 20th century have we spent behind the steering wheel? Brings new meaning to the circle of life.Think of the impact of instrumentation on human existence. There was a book I only remember parts of that traced the development of human productivity, the mantra by which we all (well most of you) now live. Before the concept of time as a visible measurement of the otherwise natural day, one's life would have been ordered by the natural cycles of light and weather, and one's relative position in the food chain. The advent of the concept of time and the invention of devices for keeping time -- the sundial in the village square, the clock in the church tower ,the boss' watch, chain and fob, the trains running on time, the 25 year watch, time and motion studies, life changed irrevocably. Time enabled the regulation, measurement, and, essentially, valuation of human activity. So here we are in 2005 hurtling towards 24 7. 24 hour a day regulation, measurement and valuation via ubiquitous video cameras and terminals and instant electronic communication (tracking anyone?). Makes one want to escape to a simpler time and the simpler pleasures of a less frantic era. Dreamer. As always I have wandered. One minute ruminating about dashboards and steering wheels and the next minute totally distracted. Lost metaphorically, I'll just make a leap back to the aesthetic. California sunshine, Laguna Seca, and vintage racing cars. I thought I was in a small minority at best in photographing odd details like the blueing of Moggie 3 wheeler exhaust pipes or the way the light played through the Lucite steering wheel of a 1935 Auburn Speedster or the driving position in the 1952 Talbot-Lago (very brave since you sat on the transmission). Then one day at the Long Beach Grand Prix, I met Henry Rasmussen and discovered his survivors series of books (Picturama Publications, Arroyo Grande). That's one of his photos at the head of this article. His studies of classic cars like the postwar MG and Morgan still delight after 20 odd years. I liked the feel of his photographs and started looking for the same feel of well executed detail in automotive toys. Well, I had a bunch of them, some film, and some time. And the results were fun, so why not? This Japanese Bandai Rolls Royce conveys the elegance of the burled walnut dash and the stately view of the RR bonnet and mascot very well. I don't know if there ever was a real model 4 door Silver Cloud but it's pretty. 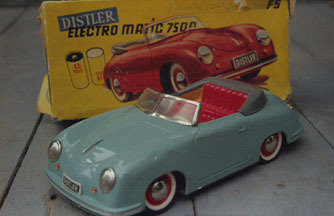 Highly prized is the 1950s Distler Porsche This is a German made battery operated model of the bathtub shaped 356 model. The dash showed full instrumentation, a nice diecast working steering wheel and a key with its own Shell logo'd key fob (quite rare to find it still there). The classic 1930s Meccano No.2 car is modelled on no particular Grand Prix car of the era but captures the power and flair of the beasts. 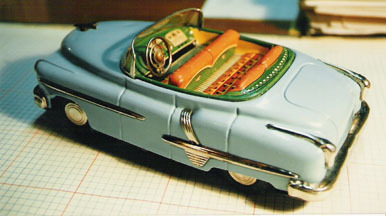 Boat tailed (with spare), a long bonnet concealing a straight 8 or 12, balky steering - even the toy version is worm and screw so that the steering wheel constricts the driver as you turn left. 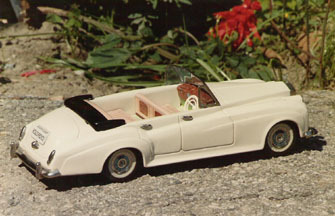 The sets built a number of short and long wheelbase models with full or cycle fenders. One of my favourite toys. One of the charms of numerous Japanese made Fat Cars is their lithography. The larger, earlier versions by Ichiko, Asahi, Marusan and similar often have a driver or at least half of one, at the steering wheel and feature very detailed interiors. This pale blue example is a somewhat simpler Buick, Chev or Pontiac of the era with a nice tin steering wheel and a pretty impressive radio! If you really want to see some wonderful dashboard technology and artistry, get to Another Man's Poison. Any out there who are equally productivity challenged have got to while away a few hours in this wonderful McCaul St. bookshop. You will find enthusiasms here beyond your ken. Hollis had (because Valerie and I bought it) a beautiful book on Dashboards , written by David Holland and published by Phaidon. What a marvellous combination of art, photography, technology and history. Even a glossary to explain the pre-selector gearbox and help one distinguish between cowling and scuttle. It is a loving look at some of the finest automobiles made and a sense for what it would be like to sit in the driver's seat. Considering the amount of time we spend behind the wheel (and less and less in the driver's seat? ), maybe this is an overlooked best of list for the 20th century. Which leads to another end of century listing we haven't seen yet. The worst panels you have looked at. I'd nominate the idiot light, basic vinyl with 8 track any year 1970s Chevette, Duster, or Torino for a start. Or perhaps any post war British sports car that's had at least 3 owners scrunched under the dash making repairs. Your nominations (and related memories) please. For those of you who read of him here or read Al Marwick's own articles in Antique Toy World over 25 years, sad to hear of his passing.